Last year, several days before Christmas, I made a whole bunch of no-bake chocolate mocha snowballs and chocolate peppermint energy bites for a Christmas party that my husband had at work the next day. I was nine months pregnant at the time and pretty much due to have the baby any day. Apparently, I went a little crazy with my energy ball making session, however, because that same night (or morning I should say – it was 1 am), I went into labour. A few hours later, we were holding our tiny baby in our arms and our lives were forever changed. So it turns out that my husband didn’t quite make it to his Christmas party and neither did the energy balls. So we were stuck with about 150 chocolate mocha and peppermint energy balls. It actually wasn’t a bad problem to have because Christmas was five days away and we knew that we would be having visitors coming to see the baby. So at least we had snacks! If all else fails, it’s always a good idea to have tasty and healthy snacks on hand. This year, I started thinking about those peppermint energy balls again since they were so delicious last year and obviously had a special meaning associated with them. 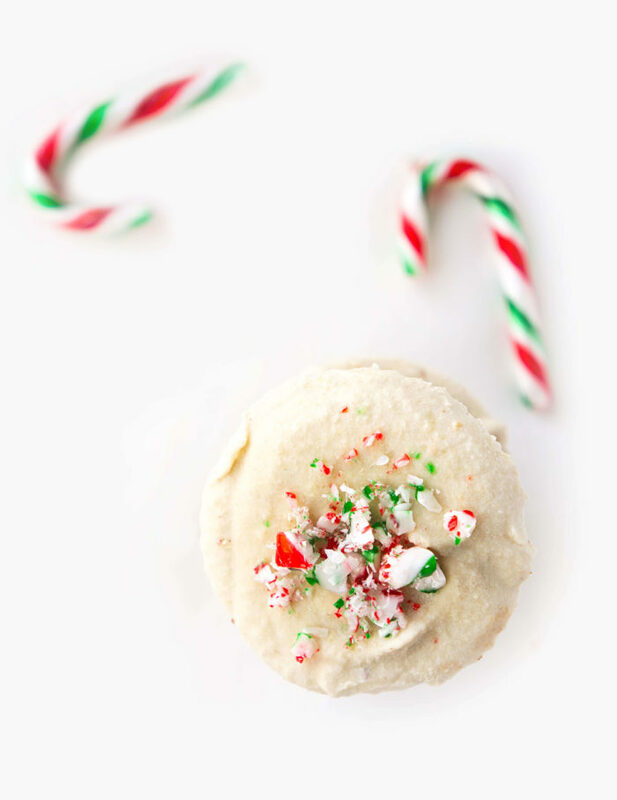 With Christmas just around the corner, I wanted to make the chocolate peppermint energy ball mixture again, just for old times sake, but decided to try something different with it this time around. 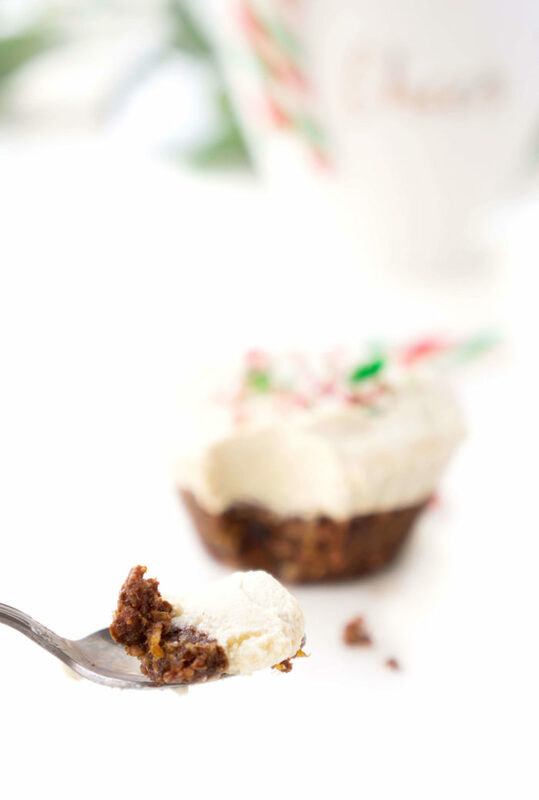 At the same time, I was feeling the urge to whip up a new flavour of no-bake cheesecake cups, so I decided to experiment with using the chocolate peppermint mixture as a crust and using a similar vegan cheesecake mixture to my lemon berry cheesecake cups and pumpkin spice cheesecake cups, except this time, it would have a minty twist. As it turns out, they were delicious and seriously reminded me of those “After Eight” chocolates we used to have as kids at Christmas time. Along with chocolate peanut butter, chocolate mint also happens to be one of my favourite flavour combos. One thing I love about these cheesecake cups is that they’re perfectly portion-controlled. A little portion-control always comes in handy around the holidays, especially if you’re trying to avoid that all-too-common holiday weight gain. 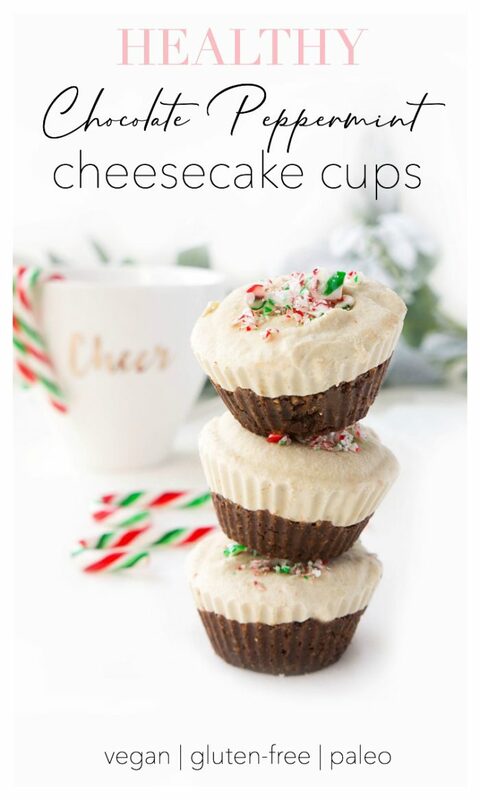 They’re also lower in added sugar than your typical holiday desserts, so once again, these cups are working in your favour, my friends! On top of that, you get all the tastes of decadent cheesecake and chocolate mint-y-ness packed into one delicious bite. It also happens to be the perfect little treat to serve for those with dietary restrictions such as a gluten or dairy sensitivity, or just generally health conscious people since they’re gluten-free, vegan, paleo and packed with healthy fats, antioxidants and fibre! For best results, I recommend soaking both the dates and cashews in advance to soften them up so that you achieve the right consistency for these cups. We don’t want big hunks of cashews and dates in these cups. I usually like to put them both in water when I wake up in the morning and then they’re good to go for when I want to make the recipe later in the day. Alternatively, you could soak them overnight if you’d like to make the recipe the following morning. You’ll also want to use a REALLY powerful blender to blend those cashews so that they’re smooth and silky, not gritty. 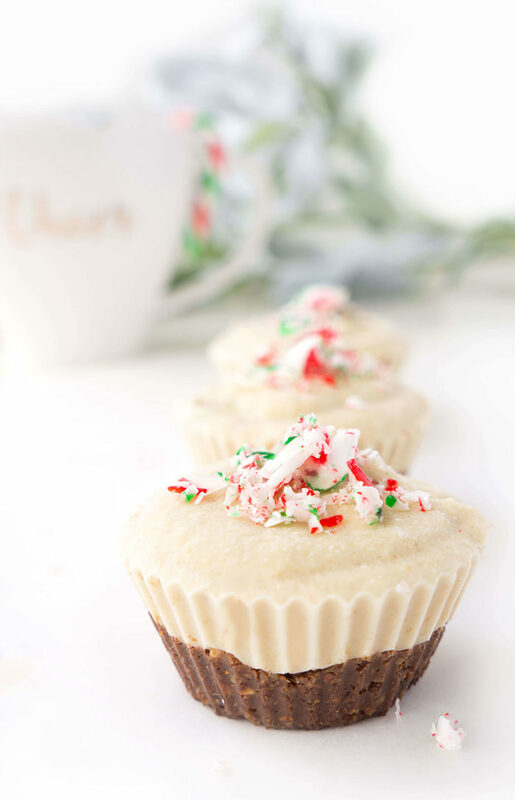 Once again, the only chunks we want in these Chocolate Peppermint Cheesecake Cups are chunks of chocolate. NOT chunks of cashews and NOT chunks of dates, unless, of course, that’s what floats your boat. 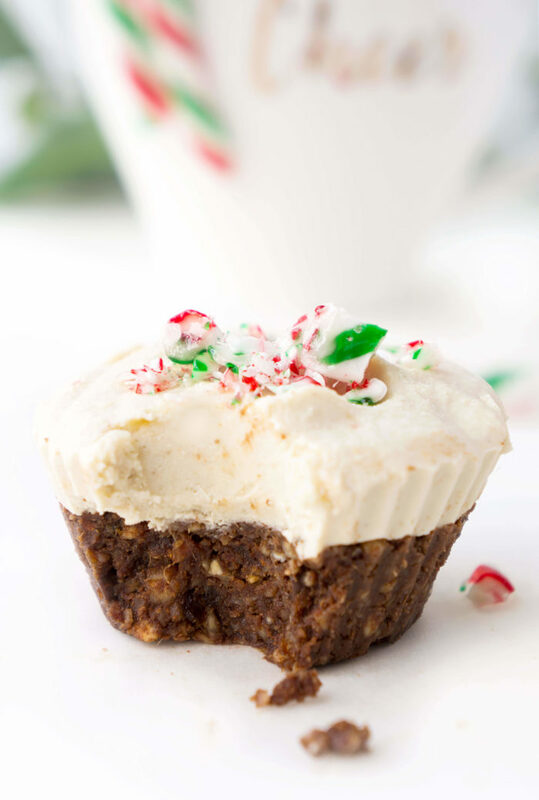 You don’t have to top the cups with crushed candy cane if you want to keep them on the healthier side. They just make the cups look more pretty and festive. If you choose to forego the candy cane chunks, I highly recommend serving them along with some of this Celestial Candy Cane Green Tea to accentuate even more of the peppermint flavour. It’s seriously the best tea EVER! I buy it in bulk EVERY YEAR. The cheesecake mixture will get pretty soft if left at room temperature for extended periods of time so I recommend eating these cups fresh out of the fridge or freezer. Simply allow them to thaw out of the freezer for about 20 minutes or so and then dig in! 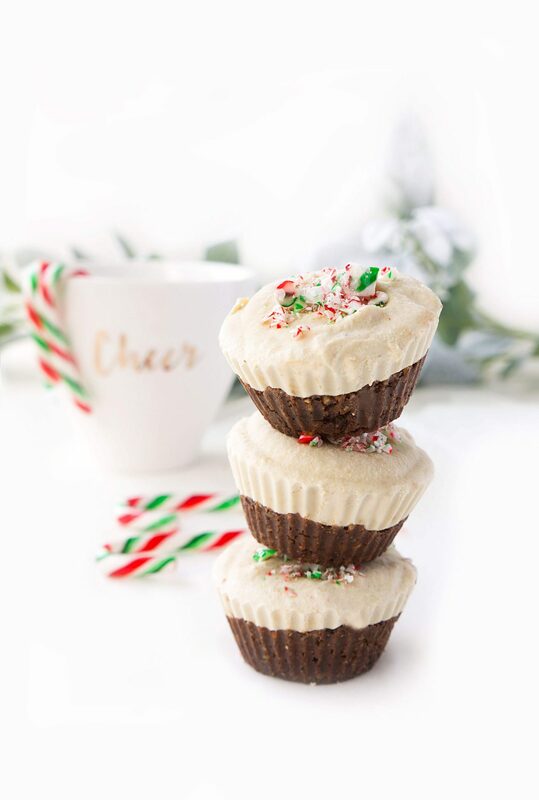 So this year, if you’re looking for a different holiday dessert to serve up, try out some of these cute and tasty No-Bake Vegan Chocolate Peppermint Cheesecake Cups! Soak cashews for the cheesecake layer in hot water for at least 2 hours. At the same time, soak dates for crust in boiling hot water for about 30 minutes to soften. Combine all ingredients for the crust in a food processor and blend until mixture comes together. You may need to add a bit of water if mixture seems too dry. Next, combine all ingredients for the cheesecake layer in powerful blender or magic bullet. Line muffin tin with 10 silicone baking cups. Divide the crust mixture evenly between the cups and press into the bottom of the cup until the surface is packed down and flat. Spread the cheesecake mixture over the crust with a spatula until relatively smooth and flat. Garnish with crushed candy cane, if desired. 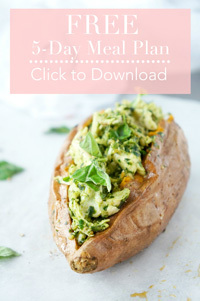 Store in the fridge for up to a week or in the freezer for up to a month. * The cheesecake mixture will get pretty soft if left at room temperature for too long so I recommend eating them fresh out of the fridge or freezer. Simply allow them to thaw for about 20 minutes or so and then dig in! Is it possible to make these with a basic cookie crust and a regular cream cheese filling? You could certainly try it out! I haven’t tried it myself, so let me know how it turns out if you decide to give it a shot!